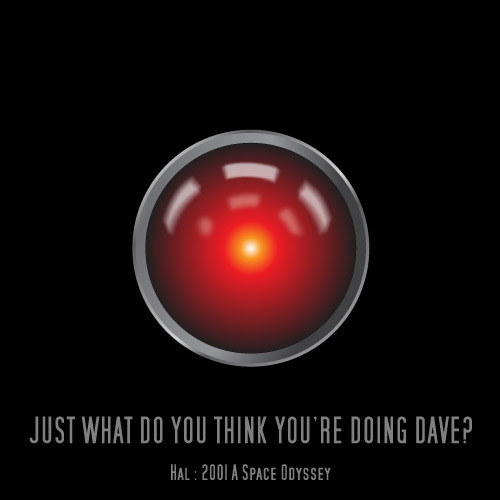 Despite the title and the graphic above this is not a post about 2001: A Space Odyssey; both are quotes from the movie and after feeling a bit controlled and dependent on the machines tonight, the theme just seemed appropriate. Hope the reference is not too nerdy. When I started working out to improve my health and lose weight I spent a good deal of time working on the strength equipment at the gym. I could plug-in my number in the computer, it would help me setup my workout and tell me when I reached my goal and tell me the next machine to use. Very convenient and very helpful for someone new to all of the gym stuff. At that time I was still a smoker and dreaded the cardio! Although I knew I needed to get on the stationary bike or the treadmill I really did not want to at the time. As my desire to walk and run continued to grow, I quit smoking and started a cardio routine of elliptical, bike, treadmill, etc. and moved my strength training to free weights, the exercise ball and even some yoga. I have focused more and more on my walking and running and started spending less time with weights and core workouts, making them just a cursory part of my routine at the end or in the middle of some cardio. Over the past couple of weeks I could definitely see and feel the difference in my arms, core and legs and not in a good way and I knew I needed to take more time on weights and core. Tonight I walked into the Y and as I walked towards the treadmill I heard the FitLinxx machine say – “Just what do you think you’re doing Beth?” I tried to fight it, tried to resist but resistance was futile and I plugged in my number and had a great weight and core workout. So now knowing that I need a little disciplined assistance to keep to this part of my fitness regiment I will bend to the will of the machines and spend at least one day a week with them. Posted on August 27, 2012 by elizagal •	This entry was posted in Health, Motivation, Self awareness, Weight Loss and tagged Fitness, Health, lifetime journey, mental-health, running, Smoking cessation, Strength training, Weight loss, Weight training. Bookmark the permalink. ← I am Iron Man! I enjoyed your post (and no it wasn’t too nerdy though I was a film student). Congratulations on all of your successes in your fitness pursuits. Especially the quitting smoking part. I have posted part 1 of 2 on the benefits of resistance (weight) training, it may be of interest to you. I clicked to follow your blog, I am definitely interested in the resistance training topic. Thanks!